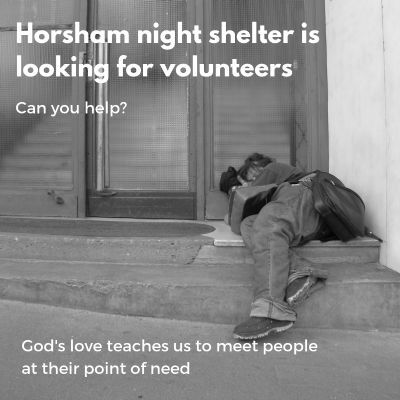 Horsham Matters operates a night shelter open daily through the winter months. The shelter reopens on 1 December 2018 and will close on 15 March 2019. The call for volunteers has reopened. More information can be obtained from Emma at Horsham Matters on the email stated on the image above. Thank you. Please watch our facebook page to find out if the Night Shelter has put out call for donations. Your support is greatly appreciated by both the volunteers who operate the shelter and the guests. We have now closed the winter 2017/18 appeal and want to share our heartfelt thanks with everyone who has supported this valuable work. Winter is never good time to be homeless. With the flurries of snow that greeted us this morning we are reminded how February can be so cold. Thank you to everyone who has donated food to this latest appeal. Tony sends out "heartfelt thanks from the Night Shelter volunteers who helped our homeless guest .... Thank you to Hilary and to the anonymous donors. All your kindness has been gratefully received by our guests." This week we aren't asking for food but if you would like to help, we will accept cash donations. drop it at the Vicarage. We will then ensure your donation reaches the Night Shelter. Every donation is gratefully received. Thank you to everyone for your support. Winter is never good time to be homeless and February is one of the coldest months in the year. It is forecast to get colder over the next few days. Thank you to everyone who has donated food to this latest appeal. Tony says he, his fellow volunteers and the Night Shelter guests have been overwhelmed by your generosity and support. Tony says, "Can I say a heartfelt thanks from the Night Shelter volunteers who helped our homeless guests enjoy a homely meal cooked by Christine...sausages & mash, carrots, peas, caramelised onions, apple pie & custard. Southwater residents have, once again, excelled - thank you to Hilary and to the anonymous donors. All your kindness has been gratefully received by our guests. A full English breakfast will be served in the morning. Every donation is gratefully received. Thank you to everyone who has already supported the Night Shelter.